By Tim & Angie C.
"They were easy to talk to and not push in any way." "The install crew were great, very professional, polite and..."
Need a quote for supporting beam in crawl space as well as potentially ventilating the crawl space. Driveway is settling and cracking. We are in the process on buying the home and there is water leakage in the basement so our mortgage company is requesting an inspection from a foundation expert. 25 x 60 Home built in 1967 on crawl space. Sill plate rotting from moisture. Needs replaced and new ventilation system to prevent moisture. Referred to you by a friend that had work done by your company. They were easy to talk to and not push in any way. All work completed as agreed. Extremely happy with your work! I was very impressed with your employees. A very high-class group of people. Installation crew works very hard & quickly. Hopefully they get paid well, as that is extremely strenuous work. I felt comfortable with the sales person. Thanks for coming out sooner than projected to do the job. David C. E. Mason St. Although we are very happy with the work we would prefer not to be used as a reference. Donald & Diana D. Kennedy Rd. We chose Ayers Basement Systems because of the price and options. It was a pleasure meeting the 3 of you. You were all business but you are for your customers needs. Thanks again to the crew. I really appreciated the information packet that was sent out. It helped me make a better informed decision. Keep up the great work! My install team was fantastic. They were all very personable and professional. We hope it all works and the leak stops. Have lived in this modular for 23 years, with no obvious troubles. After talking with a rep at "Shipshewana on the Road" at the Summit in Lansing: Jamison Betz. I realized it would be a great home improvement. Chris Murray visited, we both went into the crawl space. With his talk I was convinced. Along came Doug and his crew, fine job. 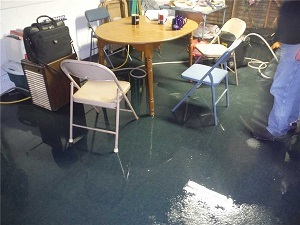 Don't let your basement flood like this MI home! If your basement or crawl space in Stockbridge is wet, damp, or humid, Ayers Basement Systems has the basement waterproofing and crawl space repair services you need to successfully keep your home safe and dry. We have 35 years of experience providing solutions to wet basements and crawl spaces for local homeowners, and as a local, family-owned company, we strive to always exceed our customers' expectations. There is no problem too big or small for our experts to solve! But why worry about a moist basement or crawl space in the first place? The main reason is that any amount of dampness or humidity makes these spaces a breeding ground for mold and rot, which can affect the air quality and safety of the rest of your home. Additionally, you're probably not getting much use out of a wet basement. Imagine what you could do with the space if it could be trusted to house your belongings! Ayers Basement Systems has proven products designed to keep your basement dry for years to come. We offer high-volume sump pumps to remove water quickly, drainage pipes and matting to give water a way to escape, and dehumidifiers to dry out the remaining air. We can also help with a variety of other products, including waterproof basement floors and walls, washer heater flood protection rings, and much more. We have crawl space versions of most of our products, and our crawl space vapor barriers double as an encapsulation method, keeping water and cold air out. For all of your basement waterproofing and crawl space encapsulation needs, Ayers Basement Systems is the local company with the expertise and tools you need. Schedule a free estimate with us today! Excavating for foundation piers is exponentially less disruptive than foundation replacement. There's nothing scarier than watching cracks develop in your walls or floors sinking away from the rest of your home, because it's all too clear that your foundation is at stake. Fortunately, the foundation repair specialists at Ayers Basement Systems are here to resolve your home's foundation troubles with efficient, lasting products and techniques. Fixing your foundation is such a crucial investment not only because it will keep you safe, but also because it will save you money down the line. A settling foundation will only get worse over time, becoming a more expensive repair. And if you're ever hoping to sell your home, you'll either need to resolve foundation issues at that point or suffer a significant devaluation of your property. If you're worried that something might be wrong with your foundation, calling in the experts at Ayers Basement Systems can provide you with peace of mind and a plan of action. We've been doing this kind of work for decades, so there's no foundation problem that we haven't seen. 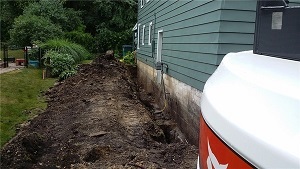 Utilizing a variety of products, from foundation piers to wall braces and crawl space support posts, we'll stop foundation settlement, straighten bowing walls, and lift sagging crawl space floors. Cracks in your driveway, sidewalk, garage, or pool deck can usually be explained by concrete slab settlement. Not only do these cracks look bad, detracting from the overall appeal of your property, but they can also cause tripping hazards as they create uneven surfaces. Rather than subjecting guests to less-than-ideal walking or driving routes, trust Ayers Basement Systems for professional concrete lifting and leveling services! We use the PolyLevel method for minimally disruptive concrete leveling. PolyLevel uses a polyurethane foam that, when injected under a concrete slab, will react, expand, and lift the concrete. This method is faster, more environmentally friendly, and longer lasting than traditional techniques. A property is usually ready for normal use just 15 minutes after PolyLevel is applied! Basement, foundation, and concrete problems are much less stressful when you know you have a qualified contractor ready to help. Ayers Basement Systems has a reputation of integrity and stellar work throughout Michigan, and we're ready to help your Stockbridge home get back to normal. For all of your basement waterproofing and foundation repair needs, schedule a free estimate with Ayers Basement Systems today! John B. of Stockbridge, MI had a sagging crawl space before he gave us a call. A sagging crawl space can be a serious problem, and he wanted to have it take care of before it could get any worse. Our solution? The SmartJack crawl space support system. SmartJack provides solid support for sagging and undersized beams, restoring stability and straightness to sagging floor joists in a crawl space. No more worrying about how that sagging can affect your home with this installment! Denver D. of Stockbridge, MI had some water coming into the basement on the east side of his home. With this being said, he gave us a call for a professional opion on how to rememdy this issue. Our fix? FlexiSpan sealant. FlexiSpan is a polyurethane sealant that seals cracks in foundation walls. This flexible sealant will never dry or crack and can flex to the natural movement of your foundation wall, ensuring a completely waterproofing seal. Water problem? That's a good one!